With our wide selection of HP Inks and cartridges, you won’t need to go anywhere else to find the best deals when it comes to replacing your printer ink. All of our products are genuine HP items or 100& compatible, whether you are looking for HP 88XL multipak ink, or other HP variants. We are so confident in our products that we also offer a complete money back guarantee should you not be happy with your cartridges for any reason whatsoever. Simply add some HP 88 Ink cartridges to your basket today and see for yourself the great value that we offer on these items. 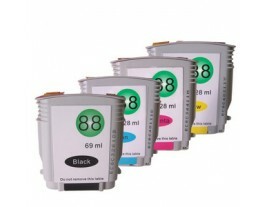 I purchased some new ink cartridges from you yesterday afternoon and was delighted when I got them this very morning!